Andrew Grice, “Half of Young Adults will Live with their Parents within a Generation from Now,” Independent, 1 May 2014. In essence, the price of houses in the United Kingdom is so high that soon many of the young will be forced to live with their parents rather than be able to afford to buy a house. What is missing from the story is the crucial point that this is mainly the consequence of UK asset price inflation in housing: this is a housing bubble. This can be seen in the graph below. The bubble clearly began under Thatcher. In fact, Thatcher’s UK was a trailblazer of asset bubbles in the neoliberal era: Thatcher’s financial deregulation – an important element of which was the Big Bang (1986) – contributed to the so-called Lawson boom (1986–1988), at the centre of which was a debt-financed property bubble. When this collapsed in the late 1980s, a debt deflation ensued in the UK in the early 1990s recession (Stewart 1993: 56–57, 101–102). But this was just a minor harbinger of the tremendous bubble that exploded under New Labour (in power from 1997 to 2010). The terrible price of this bubble is simply: many people will not even be able to afford a house if it continues. Philip Pilkington, 2014. 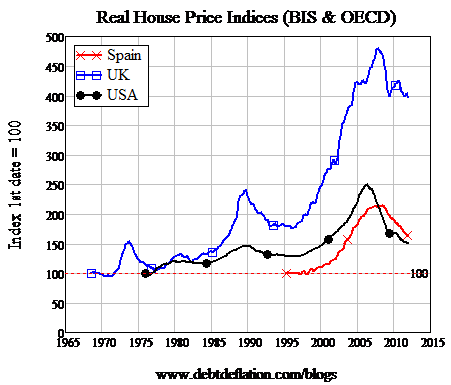 “Has the UK Got Another Property Bubble?,” Fixing the Economists, May 1, 2014. The question whether the UK is in a property bubble now is difficult to call, and Philip speculates that the UK may develop into a new rentier society with property increasing owned by the rich and rented to lower income earners. That post is great, and I was not aware of the problems with the data from the BIS Property Price index. I have added an addendum above and linked to that post. 'In essence, the price of houses in the United Kingdom is so high that soon many of the young will be forced to live with their parents rather than be able to afford to buy a house." Why is this a sign of a house price bubble rather than a sign that demand has simply run ahead of supply ? Assuming that there is not a large number of empty houses in the UK owned by speculators waiting for the price to rise then there must be people who are able and willing to buy and occupy the houses that are no longer affordable to the young. If prices fell these existing owners are not going to sell there houses to the young and become homeless are they? There are an estimated 900,000 or more empty homes in the UK as of January 2014. A slight stumbling block to your theory? Well, I don't really have a theory - I was just pointing out that that one factoid about young people living at home didn't prove your point. The existence of housing being owned for speculative reasons is a different and stronger reason why there may be a bubble. I am very interested on this argument, since there is a similar issue in Rio de Janeiro, Brazil. Here, i am convinced so far there is no bubble, but only better credit conditions in credit constraint economy. In UK, i could not get the whole picture. Rob's coments sound reasonable. The article in The Guardian shows a urban problem, but not a speculation risk. Please i would be glad if anybody has more information and a accurate analysis in this question.